Every other Friday, Edna Esh and three of her childhood friends meet to bake sugar cookies for their respective church districts on worship Sunday. Its a time to give to the Plain communityand give support to each other as they share their joys and fears . . .
Ednas friend, Vera Bontrager, has a problem. Her outspoken twenty-year-old daughter, Myrna, has been fired from her job. Again. Myrnas family really needs her to chip in, but shes clearly unsuited to customer servicenot to mention that her sharp tongue scares away any boy who might come courting. But Edna has an ideaand his name is Ezekiel Riehl. A widower with four young children, Ezekiel needs help. His house and his brood are a mess; his demeanor is gruff. Its no surprise Myrna takes an immediate dislike to him. Yet she has no choice but to take on the challengeand soon she starts to create order out of chaos. In fact, the kids begin to depend on Myrnaand so does Ezekiel. The truth is, shes fallen in love with him. But if hes to prove hes not looking for a marriage of convenience, hell have to convince her of whats in his heart . . .
Sarah Price comes from a long line of devout Mennonites, including numerous church leaders and ministers throughout the years. Her involvement with the Amish dates back to 1978 when she wrote her first novel, Fields of Corn, while studying anthropology and writing at Drew University. She was drawn to the amazing culture of the Amish of Lancaster County where Ms. Price is involved with numerous Amish communities and is considered family by some and friend by most others. First Impressions, A Retelling of Pride & Prejudice, Sarah's salute to Jane Austen from an Amish perspective, debuted on the ECPA bestseller list. Ms. Price has advanced degrees in Communication (MA), Marketing (MBA), and Educational Leadership (PhD) and was a former college professor. She now writes full-time and talks about her books and her faith on a daily live stream with readers. Learn more about Sarah and her novels at SarahPriceAuthor.com. 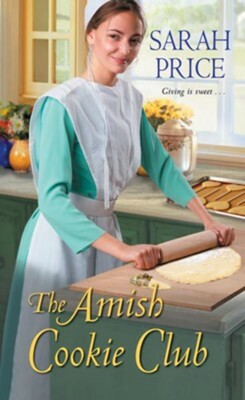 I'm the author/artist and I want to review The Amish Cookie Club / Digital original - eBook.